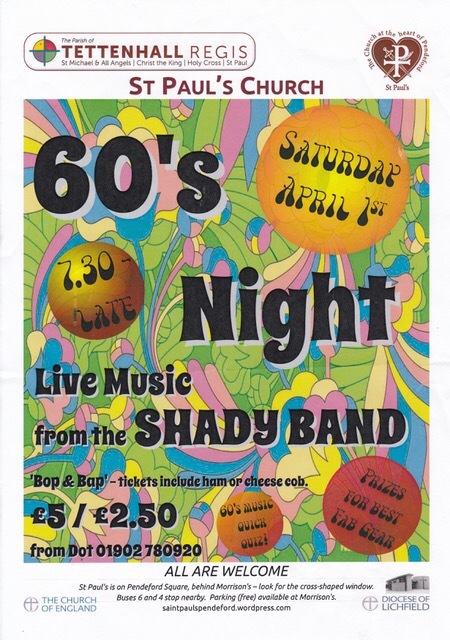 Why not come and join us for our 60’s night with The Shady Band. A great night of music with a 60’s music quick quiz. Why not dress up for the chance to win a prize. Tickets include a ham or cheese cob. Our church holds a weekend away every two years, in the beautiful grounds of The Quinta, a Christian centre in Shropshire (about an hour away). This year’s weekend away will be 19th-21st April. The title of the weekend is “Living Grace – Receiving and giving”. Our guest speaker is Reverend Simon Thorburn, who was vicar at Saint Paul’s in the late 1980s. The cost of the weekend has been cut this year! Booking forms are now available in church. Speak to Greta or Marion for more information. It is our intention that no-one should feel prevented from attending on cost grounds. If you would like to attend, but feel cost would be an issue, please don’t hesitate to speak to Greta, Marion or Jim. A quick reminder that our annual Christmas Carol Service is tomorrow evening (Sunday 16th December) at 6:30pm. There will be popular carols and readings, followed by mulled wine and mince pies. So, what’s on at Saint Paul’s over the next few months? Get your diary out and write all these in…! • Sunday 16th December – our annual Christmas carol service, starting at 6:30pm. Come along to sing your heart out… there’s bound to be mince pies and mulled wine too! • Monday 24th December – Christmas Eve Christingle Service, starting at 4:00pm. Candles, oranges, collections for the Children’s Society and worshipping God! • Monday 24th December – Our Midnight Communion service, starting at 11:30pm (with hot chocolate beforehand). Welcome the new-born King. • Tuesday 25th December – 10:30am Christmas Day Family Eucharist. • Thursday 28th February – Fashion Show evening – a chance to brighten up your wardrobe and support St Paul’s in the process. • Friday 19th – Sunday 21st April – our church weekend away in the wonderful setting of the Quinta, in Shropshire. Our guest speaker is Rev’d Simon Thorburn. The Oasis café will be open from 6:00pm on the evening, serving refreshments.